Spaghetti Bolognese – My Version! This is my version of the popular sauce (ragu alla Bolognese) that originated from Bolgna, Italy. Traditionally this is made with beef mince but my version uses lamb mince. The recipe is a variation of many recipes that I have tried earlier and it incorporates the best of both worlds – knowledge derived from expert chefs and my own unique ‘genius’! Without further ado I present my version of a dish that is easy, delicious and a great prelude to a romantic night. Boil water (approx 500 ml) and throw in the tomatoes. Let them boil until the skins begin to peel off. Remove the tomatoes from the water. De-skin the tomatoes and blend into a thick puree. Add the chopped onions and garlic. Fry until they turn soft. Add the mince. Fry for another 4-5 minutes until it just changes color. Add the wine and balsamic vinegar. Cook on high flame until the gravy is reduced to nearly half. Add the tomato puree and chopped green tomatoes. Season with salt. Bring to a boil. Cover and let the sauce simmer for approximately 30-40 minutes or until the mince is cooked. This is your bolognese sauce – simmering gently waiting to be done and gently put over steaming spaghetti! Boil some more water in another pan. Add a teaspoon of olive oil and some salt to this. Cook the spaghetti in the boiling water as per the instructions on the pack. Tear the basil leaves and mix them into the bolgnese sauce. 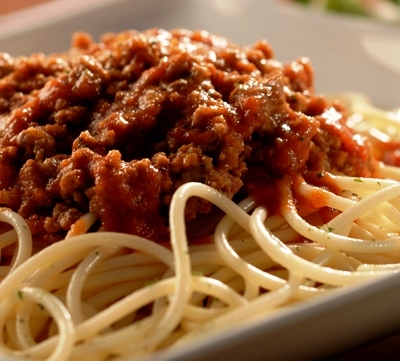 Make a bed of spaghetti on the serving plate. Put a generous amount of the bolgnese sauce on this. Generously sprinkle grated parmesan or cheddar cheese. Enjoy the meal! I was so delighted with my recipe that I had my son make it the following night. It was successful. I polished off two glasses of good Indian wine in celebration of this wonderful dish. Dim the lights, serve this to your beloved in a nice white plate, with a glass of wine, soft candle-light and even softer music. A fresh salad on the side will be great but not essential.